My last post was on the different patterns that make up syllable division. Now, I want to go through each pattern and how to label a word for easy pronunciation. If you have not read the post(s) on REVLOC, please read that now, and come back. It is important to have an understanding of REVLOC before dividing words, because after dividing the words into syllables, the rules of REVLOC will make pronunciation of the word much easier. 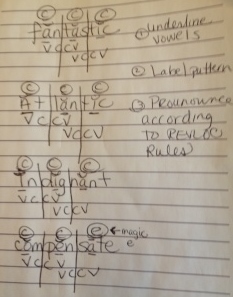 The first pattern (I learned in the OG course I took) is VCCV, or Vowel-Consonant-Consonant-Vowel. There are four different kinds of VCCV word patterns. They are labeled according to REVLOC syllable types. To determine the type of word, we underline vowels, label the pattern, (in this case) divide between the two consonants, label each syllable based on REVLOC, and use that labeling to pronounce the word. Here are examples of each type of word patterns. See if you can divide them! Rabbit words. Underline vowels, divide between consonants, label syllable according to REVLOC. In order to make sure a student is grasping the concept and not just memorizing words, it is common to use nonsense words in exercises. Below is an example of some nonsense words to divide. In addition to coding words, students should practice reading all words out loud. This fortifies the understanding of the different syllable types and the sounds they make. Students should even read the nonsense words. Reptile Words. One closed and one magic e syllable. Divide between two consonants in VCCV pattern. Candy words. One closed syllable, one open syllable. VCCV divide between the two consonants. Hornet Words. One of the syllables will be R-controlled. Divide between the two consonants. 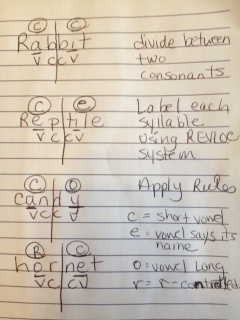 Here is a list of three syllable VCCV words. And a picture of how they would be labeled. This is great! I’m going to add this site to me need to read list! Thank you for letting me know! It feels nice that my work here is appreciated. This is a very good site for me while doing my homework. I hope that you will come up with more very sophisticated words. Wow, I was amazed to find this information today! I am an ESE elementary school teacher who has gone through the training of Project Read.Project Read teaches the 5 cutting patterns and 7 syllabication types. I wanted to start teaching my 8 year old this way of decoding ,so when I searched for vccv words I came across your sight. I am SO EXCITED! I did a lesson with her and my niece with vccv and used your terminology of “rabbit,reptile, candy, hornet” words and it went so well! I made a color coded list of each type and taught them how to “cut/mark” the words. Thank you so much! I am now visiting your other posts to check out that terminoglogy….like camal and tiger words. This is awesome!